This is always my favourite, wholemeal date scone. With strawberries and fresh whipped cream... Yum! Preheat oven to 200°C (or 180°C fan forced) . Line a baking tray with two layers of baking paper and set it aside. 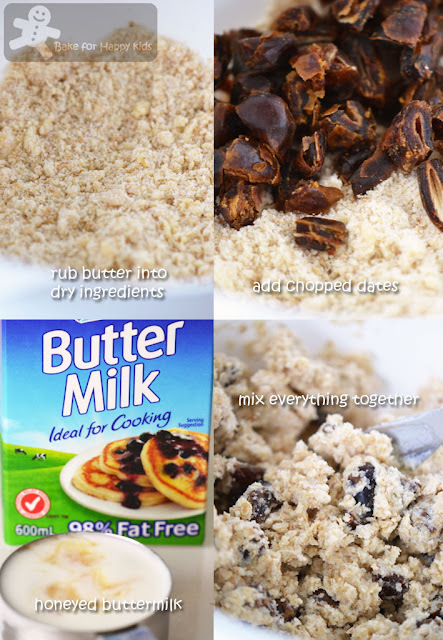 In a large bowl, sift all dry ingredients together, then rub in the butter, chop the dates and mix them in. In another bowl, whisk together buttermilk and honey. Make a well in the middle of the flour mixture and pour in the honeyed buttermilk. Mix everything to form a soft dough. Lightly knead everything together and tip it out onto a floured chopping board. Shape the dough into long rectangle, flattening the top to form a thickness about 4-5 cm. Cut the dough into fat little triangles with floured knife. Sit the scones closely on a prepared baking tray and dust them with a little extra flour. Bake for 17 min or until scones are golden in colour. Leave them to cool on a wire rack for at least 10 min and serve while they are warm. Note: Using half amount of the recipe, I can make 4 triangles scones. Happy Baking and enjoy the scones! The date scones look delightful. The opportunity to bake alone in your kitchen for a few hours priceless. Enjoy your time in Lome. These scones look really nice! i shall keep in mind lorne the next time i visit mel if i have time. Had missed going to the GOR the last trip. I havent actually baked anything with dates and your wholemeal ones sounds great and very nice texture too I like baking too when no one is in the house but it's quite impossible..haha..i just tell them not talk to me especially when i'm weighing my ingredients! Hi Zoe, thanks for visiting my blog and for your kind words. Hope you visit regularly and keep enjoying the recipes I post. I love dates and every year I wait impatiently for Ramadan as that's when dates are in abundance all over Singapore. I love sticky toffee pudding made with dates, but your scones look wonderful too - perfect texture! 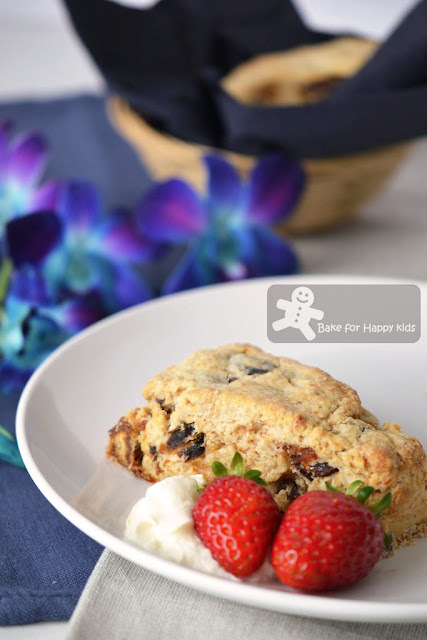 beautiful scones , thanks for sharing this wonderful recipe . But i never come across wholemeal self-raising flour . Will look for it nextime i visit the shop for ingredient . Hi Zoe, thanks for visiting my blog and for your kind words. Your scones are lovely. I love dates in anything and it looks like you achieved the perfect scone texture! Hi Zoe, Your scones looks lovely with the speckled wholemeal and sounds delicious with dates! Yeah, I love to bake when the house is empty! Most of the time I bake in the morning, when there's nobody around, only me, my kitchen and my oven, and my cup of tea! Hehe! Zoe, I agree that being able to bake undisturbed is wonderful me time! Love the idea of using dates in the scones... will be sure to try it out when I can find dates here in Singapore. 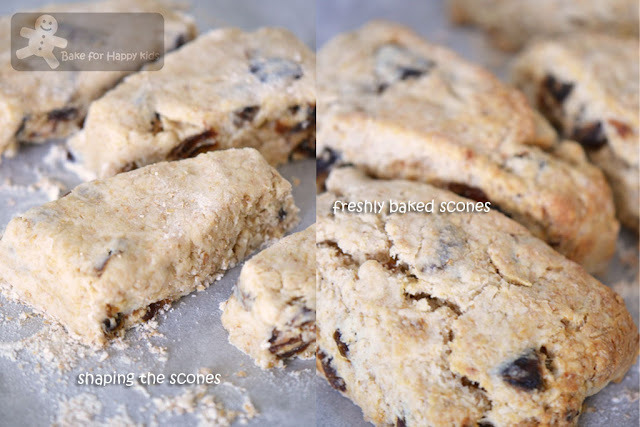 Your dates scone recipe come in time. I can used up my dates which I bought very long time ago. Your last picture make me smile :) Looks like I must try out this scone too. I would eat your scones! They look great! Fluffy on the inside, just as I like them! You got one great scone here, Zoe! Wholemeal and dates - I can almost taste them in my mouth. And you are funny with your thought about flying to Lorne, lol! 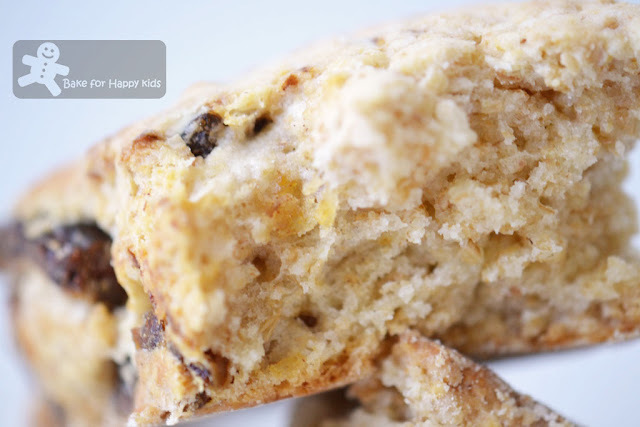 one more "healthy scone" for our bakealong :D. I love dates in my bakes and m sure this must've tasted great! Bookmarked!! I laughed out loud when I read your post, we almost have identical story except I have never been to Lorne lol! I only baked my scones for myself too as my sons are not into them and I too added dates into mine! Talk about coincidence! These scones look delicious ! Healthy as well ! This wholemeal date scones were not only healthy, but looked very presentable. I love all the pictures here in this post. Thanks. Have a lovely evening, dear. Zoe, thanks for visiting The Saucy Gourmet, I look forward to sharing with you! These scones look incredible. 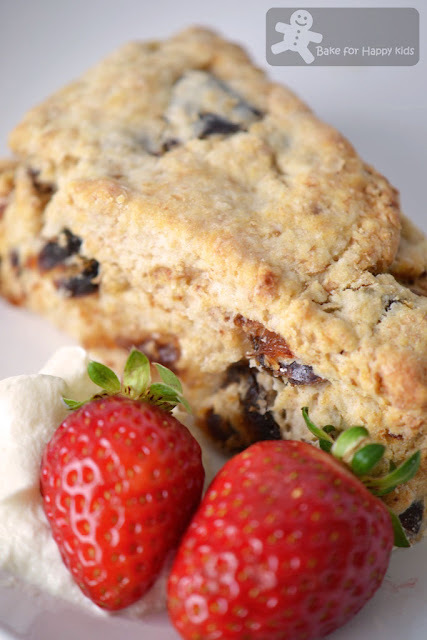 I have a couple scone recipes posted on my blog, gonna go back and see if any are worth linking in. oh dang, seeing your comments on lorne make me wish i booked that instead of apollo bay when deciding on a place to stay at on GOR! Wow they looks stunning and fabulous.. I am crazy about scones and am always looking for new recipes. I make scones at least a couple times a month and my family always wolfs them down. I will put these on my to-bake list, they look delicious!! Great scones...wholewheat and date...they look so light, soft and fluffy Zoe. These look SO good! I've only recently discovered scones, and I've got to say, they are my new addiction. I have never tried dates, surprisingly. I think I need to try them out sometime soon! I must confess that I have never made scones before but as I always want to try new things they are now in my list to try. I would love some right now with a cup of coffee. Your Lorne traditions sound pretty good to me! Yum buttermilk. So underrated. These look great. Scones are only good for the first few hours that they are cooked, in my humble opinion. Lucky I eat them quickly! I like this take on scones with the dates. They sound great. Wow, I'd like to have some for tea! Those look like PERFECT scones! full of flavor - moist and delicious - great recipe and quite healthy too! Nice scones! And love your "thought" picture - very creative. Really nice post - thanks. Scones are my hands down favorite! But I've never made them with dates. What a great idea. These look light as air, Zoe! These would be scones I would bake for me also. They are just scrumptious looking! LOVE your blog title. I so agree with it. That's why I originally started baking, it was always something fun to do with my kids when they were little and I needed "a break". It was me time snuck into them time and we were all happy. Now, they are almost grown and I still bake with my youngest. Nice times. Thanks for stopping by my blog. These look super moist and delicious. Have fun in Lorne!! Hi. I m looking for a Malaysian sweet snack recipe yuen koe. I'm sorry that I'm not sure of the yuen koe that you are referring in your question and can't help much to answer your question. Do u think I can replace wholemeal self-raising flour to wholemeal flour? are both the same thing? According to Australian Women Weekly at http://www.aww.com.au/food/expert-q-a/2013/11/how-to-make-self-raising-flour/, you can make your own self raising flour by adding 2 tsp baking powder into each cup of plain flour. To make 250g of wholemeal self raising flour, you need to add 3 1/3 tsp baking powder into plain wholemeal flour. Cheers!